In this post we will look at Berger Paints, the second largest paint company in the country. The company was started in 1923 in India as Hadfield’s (India) Limited with one manufacturing facility in Howrah.It was acquired by British Paints, UK in 1947 and in 1983 the name of the company was changed to Berger Paints India Limited. The current promoters of the company Kuldip and Gurbachan Singh Dhingra acquired it from the then United Breweries chairman Vijay Mallya in 1991. It was the smallest paint company in 1991. Presently, it is the second largest company in the paint industry in India, with consolidated TTM revenues of Rs 5,888 Cr. 80% of the revenues for the company come from the decorative segment. The company also has its presence in the industrial paint and construction chemical business. We will look at the different segments in a bit. In addition it offers Express Painting, it offers to paint houses and flats for individual customers, which the company claims is 40% faster than traditional painting and carried out at the same cost. The company has 10 manufacturing units, with 110 stock points and strong distribution network of +25,000 dealers across the country. The company also has an international presence in 4 countries (Nepal, Bangladesh, Poland and Russia). Berger’s sister company is the leader in Bangladesh, with a share of 65%. The paint industry in India is estimated to be Rs 50,000 Crs. Organized players have a share of 65%, the rest 35% being held by the unorganized players. The four largest players in terms of revenues in the organized market are – Asian Paints, Berger, Kansai Nerolac and Akzo Nobel. It is estimated that the paint market will grow to Rs 70,000 Cr by 2021. Growth in the paint industry is correlated to the GDP growth, the industry grows 1.5-2X higher than the GDP. The decorative segment constitutes 80% of the market and includes interior and external emulsions, distempers, wall putty, wood coatings, primers, thinners, cement paints and putties. These are either water based or solvent based. The leader in the decorative segment is Asian Paints. Industrial paint segment comprises of general, automative, protective and powder coatings. They form 20% of the market, with 2/3rd demand coming from the automotive sector. Kansai Nerolac is the leader in this segment. Akzo Nobel has also got a significant presence in this segment. The major raw material for the paint companies are crude oil and its derivatives. Margins are then impacted by the change in crude oil prices. Companies generally pass on the increase in oil prices by hiking the prices of the final product. The 10 year revenue growth for all the companies is in double digits, however the 5 and 3 year growth rates haven’t been impressive. The question then to ask is given these growth rates do the companies deserve the current valuations at which they trade? Gross margins of Asian Paints are the highest, as can be seen from the above chart. It indicates the pricing power that the company enjoys as the raw materials required to manufacture paints are the same for all the companies. Berger’s EBIDTA for FY18 was Rs 807 Cr, TTM EBIDTA stood at Rs 870 Cr. 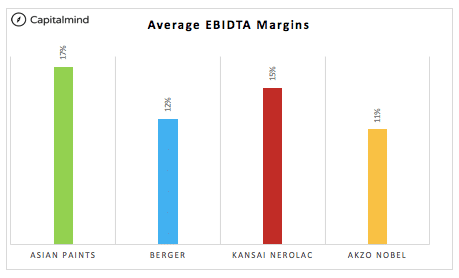 EBIDTA margins were 16%. One can see that there has been an improvement in the margin profile of the company over the years. This can be due to change in product mix of paints that the company sells, company enjoying pricing power, efficient management of fixed costs and fall in raw material prices over the last 2-3 years. Remember that crude prices crashed in FY14 and have been low since. But paint prices were perhaps defensible, due to the brand. EBIDTA for the company has grown at 20% CAGR over the last 10 years. How does this compare with the other players in the industry? The average 10 year margins of Asian Paints are the highest amongst all the players. However Berger’s absolute profits have increased the at CAGR of 20% in 10 year period (FY09-18), while Asian Paints has increased its profits by 17% in the same time. PAT for the company at end of FY18 was Rs 460 Cr, TTM PAT stood at Rs 500 Cr. PAT margins for FY18 were 9%. PAT has grown at impressive 19% CAGR over 10 year period. Margins have doubled since FY09, there has been a jump in margins in FY16 and the company has maintained those in the following years. Margins have also improved due to lower interest outflow over the years. The debt to equity ratio at the end of FY18 was 0.19, peak ratio was 0.58 in FY13. The above chart shows the 10 year PAT margins of all companies. It must be noted that Kansai Nerolac had margins of 24% in FY16 due to other income of Rs 563 Cr recorded during that year. 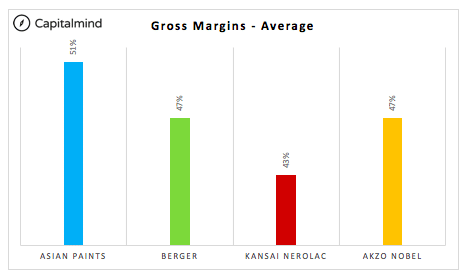 In the case of Akzo Nobel, margins were higher in the FY09-12 period, the 5 year average margins of Kansai Nerolac and Akzo Nobel are 10% and 9% respectively. 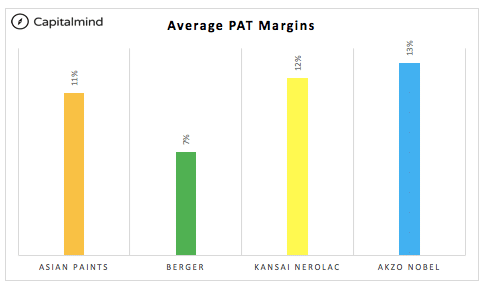 Adjusting for these, Asian Paints has the highest PAT margins among all other competitors. 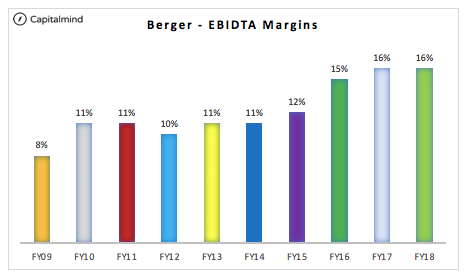 Berger has grown its profits at 19% CAGR in the FY09-18 period, highest among all the players. 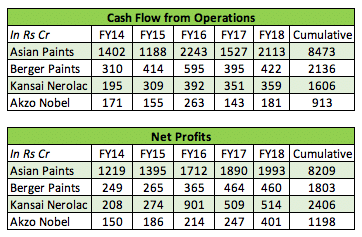 Asian Paints in the same time has grown profits by 17% CAGR. Akzo Nobel has a negative cash conversion cycle, however on closer look one finds that it is because it is because the company’s average payable days over the last 5 years are 90, meaning the company pays its suppliers once every 3 months. This is not the case in the other companies, payables days for the other companies are in the range of 55-60 days, meaning they pay their suppliers once every 2 months. Among the other three companies Asian Paints has an average CCC of 19 days, this is on back of a faster collection period. The 5 year average receivable days are 26, meaning the company collects money from its customers once every month. There is scope for Berger to improve its CCC when one looks at the other companies in the industry. If one goes back in time, the company has shown improvements. The average CCC for FY09-13 was 58 days as compared to the latest (FY14-18) average. However there is much more room for the company to improve its CCC going forward. Cash flow from operations (CFO) of Berger have been positive over the last 5 years, this is the case with all the companies in the industry. We compare these CFO also known as cash profits with the net profits or accounting profits to check if the accounting profits are getting converted into cash. 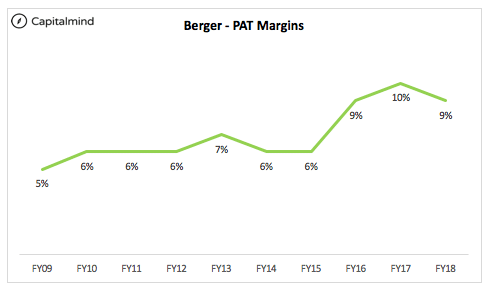 Berger comes out with flying colours on this front, its 5 year cumulative CFOs are Rs 2,136 Cr as compared to the cumulative net profits of Rs 1,803 Cr, the cash profits are higher than the accounting profits. This can be due to efficient management of working capital or higher non cash expenses (depreciation) being added back to arrive at the CFO. In the case of Akzo Nobel and Kansai Nerolac, the accounting profits are higher than CFOs due to higher other income being accounted while arriving at the net profits. Free cash flow (FCF) is also positive in the case of Berger, the 5 year cumulative FCF in this case is Rs 976 Cr. FCF can be used to pay debt, interest and dividends. The Q3FY19 results have been good for the company. Revenues have increased 20% YOY and 9% QOQ. However YOY profits – operating and net have grown by 5% and 3% respectively. This is on the back of increase in raw material costs, operating profit margins (OPM) for the latest quarter is 15% as compared to 17% in Q3FY18. There is an increase seen in interest costs and depreciation expenses, this has resulted in growth in net profits of only 3%. Asian Paints in the same period has seen growth in revenues of 24% YOY and 14% QOQ. Operating profits have grown by 17% YOY and net profits by 15%. At the end of September 2018, the company had borrowings of Rs 400 Cr, the debt/equity ratio of the company is 0.18. Company had cash and cash equivalents of Rs 123 Cr. The paint industry in India has a long run way ahead. India’s share of the world paint market is 0.6%. Increase in incomes and improved standard of living will help organized players. GST for paints has been reduced from 28% to 18%, this should help players in the organized market. Frequency of getting one’s home painted is reducing, while earlier it was 10-12 years, it is every 5-7 years people get their homes painted. Per capita consumption of paints in India is 3 kgs, lower in comparison to other developed countries. All of the factors stated above does warrant an investment in some of the paint companies listed, however Asian Paints, the largest paint company trades at 62X PE, Berger 63X, Kansai 51X. Although one does not invest in a company by only looking at the PE, buying these at such elevated levels will require deep conviction and patience to make handsome returns if any. Even if the company does well on returns, a return to less exorbitant P/Es could keep the company price lower than otherwise expected. 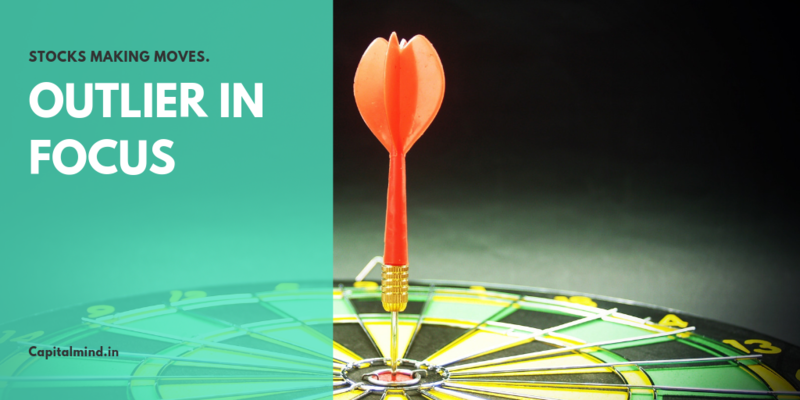 It is an outlier in terms of a price move over the last few months, but its sustenance from the fundamental perspective requires a major push to growth – for which we’ll have to wait for the end-year results to check. Note: Not a recommendation. This is just a quick analysis of a stock that seems to be showing strong price movements in the short term. Don’t just buy or sell based on this analysis – consult with a financial advisor before taking action. All market investments involve risk of losing money. Authors at Capitalmind may have positions in securities mentioned in the article.